Darnley Cascade is a cascade waterfall measuring 4 metres high. Located at Crooks Hollow Conservation Area in Greensville, its source is Spencer Creek. At 225 metres above sea level, it’s the highest elevation of any Hamilton area waterfall. 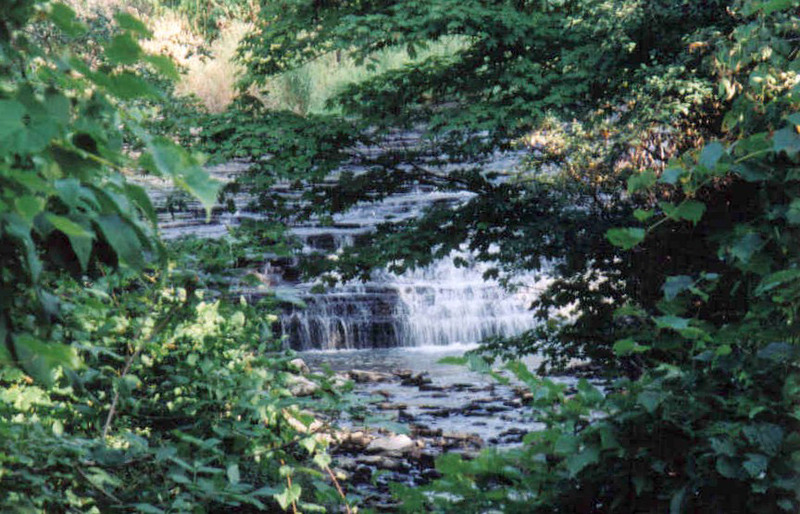 Darnley Cascade is located in Crooks Hollow, which has a rich historic past. 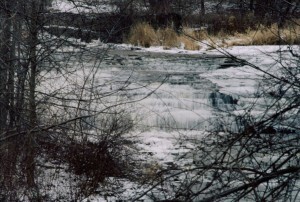 Many early settlers, namely United Empire Loyalists fleeing the United States at the end of the American Revolution, came to the area and settled along Spencer Creek. James Crooks, a Scotsman by birth, founded Crooks Hollow in 1805. He built the locality’s first grist mill and named it after Lord Darnley, whom he idolized. 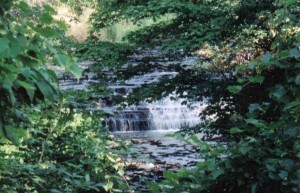 The waterfall soon became known locally as ‘Darnley’s Cascade’. 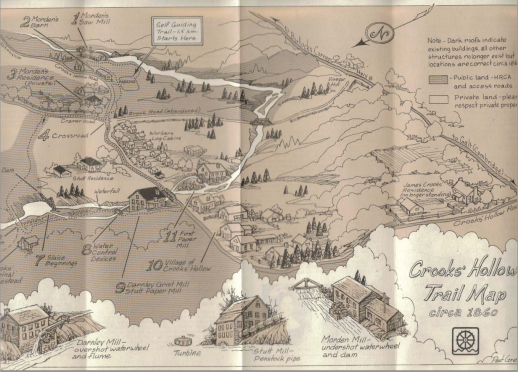 The grist mill attracted local commerce: by 1829, it was surrounded by a woolen mill, distillery, tannery, paper mill, clothing factory, an inn, workers’ log cabins, and more. 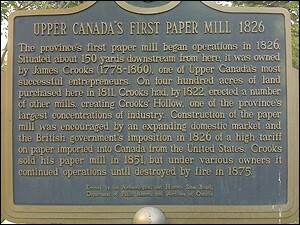 After Crooks died in 1860, the mill was sold to James Stutt and Robert Sanderson, who converted it into a papermill. In 1880 Stutt bought out his partner and added a steam boiler building for heating water for papermaking and auxiliary power. Unfortunately, the boiler exploded on July 9, 1885, killing two men and causing extensive damage to the property. The mill was reconstructed, and in 1902 William Stutt, son of James, took it over. He leased it out first to the Adams Cellboard Company, then the Greensville Paper Company. When the mill was gutted by fire in 1934, it was the end of an era. Darnley Cascade was featured on a few vintage postcards dating back to about 1911. 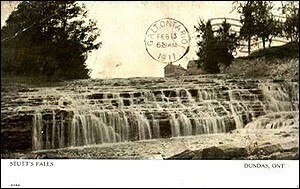 It is interesting to note that these cards refer to it as “Stutt’s Falls”, after new owner James Stutt. Joe Hollick’s “Waterfalls of Hamilton- Autumn” poster includes it under the name of Stutt’s Falls, and some local residents still refer to it thusly. To reach the Darnley Cascade by car, exit from the 403 onto Highway 6 North, then go left onto Highway 5. Turn left onto Brock Road and then right onto Harvest Road. 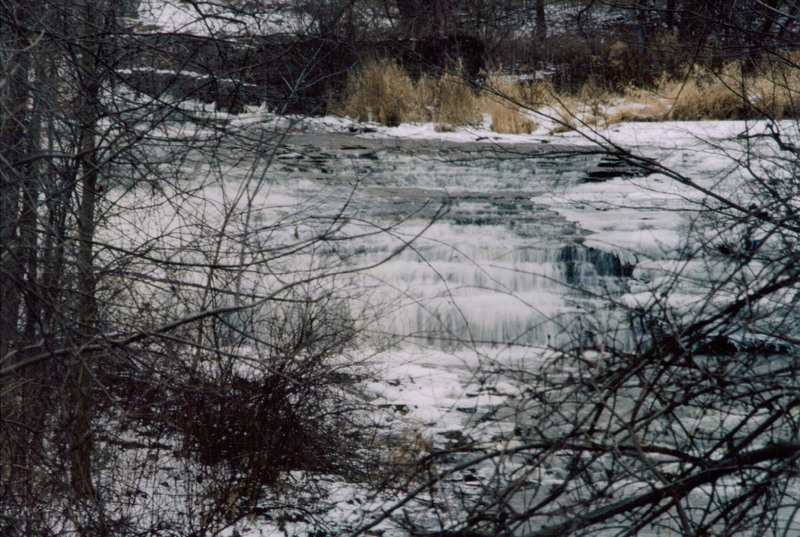 To reach the waterfall by walking trail, you can take the Dundas section of the Bruce Trail, the Crooks Hollow Historical Trail, and ‘Round the Lake Trail at the Christie Lake Conservation area.